Over six feet of snow fell in some areas of Buffalo, New York this week, most of it in a 24 hour period. It must be Global Warming. The short answer is: yes. 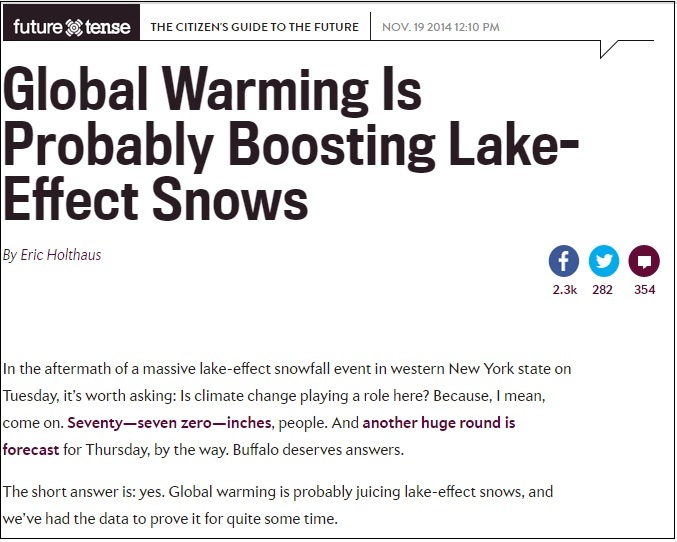 Global warming is probably juicing lake-effect snows, and we’ve had the data to prove it for quite some time. If you live in the United States, you have been feeling insanely cold lately. The area south of Buffalo got five feet of snow yesterday — an extreme winter weather outburst that is being blamed for a tragic five deaths — and the Weather Channel says that parts of the Midwest and Great Lakes region may experience “one of the longest sub-freezing spells on record for the month of November.” But the whole United States has been quite cold. In Washington, D.C., last night, a weather emergency was announced due to the expectation of extremely cold temperatures. We’ve been through this drill before — last winter, actually. And it’s important to keep in mind that just because it is very cold in the United States doesn’t mean that you should question the overall warming trend for the planet. Weather shifts heat and cold around — we know that. We also know our own local experiences inherently bias us, since we live the weather in only one place. But the total global picture remains one of warming. 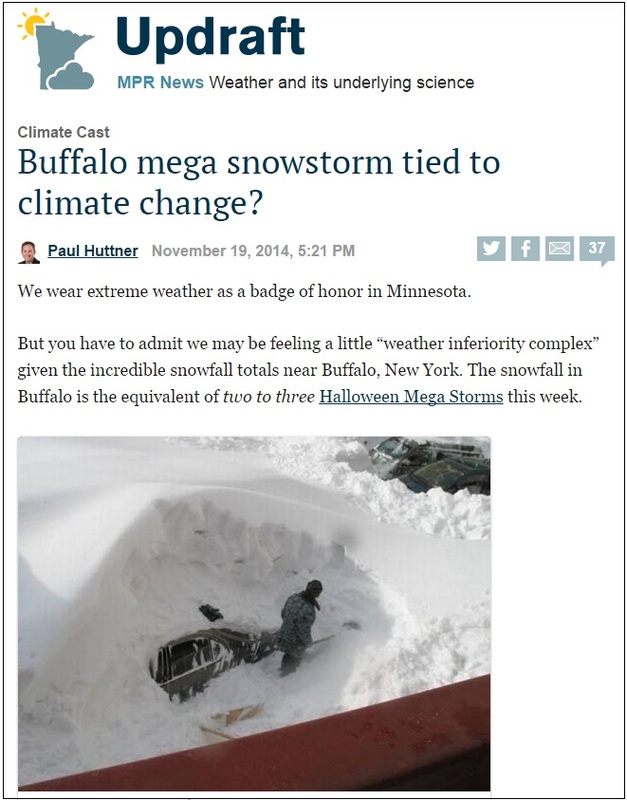 The MPR Updraft also tried to tie the record snow to global warming. So all that snow… in November is certainly proof that climate change is bunk right? No way you get that kind of snow if the climate is actually warming? Yes, it sounds counter-intuitive. How can you have more snow, earlier in the season with a warming climate?